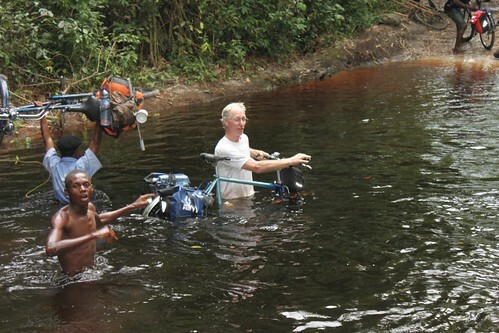 On the banks of the Lomami River, Bolaiti is one of the most remote settlements in East Kasai Province. The small community supports the bicycle traffic that carries agricultural produce to Kindu, 120 km further east. Alima Mutingo, now 12 years old, was just over a year old and already walking when she caught polio. She is fourth of 7 children. Pictured here at our house in Kindu with her mother, Johari, her youngest brother, Amisi, and her uncle, Omombo. Alima responded, barely audibly to the greetings and smiles from our strange group. She had never seen such a gathering of white people in her life. Despite the crowds and the novelty of our group she remained solemn and dignified, sitting upright on the ground supported by her arms. Obviously Alima was a polio victim. On questioning, her aunt explained she had never seen a nurse or left her natal village. Born in 1999 in the height of the rebellion, she was among a group of children that were never vaccinated. “We are at the end of the road”, Alima’s father, the chef de groupement explained to us when we asked how long the village had remained unvaccinated. Vaccinations were resumed in Kasai Province after the war in 2005, but it wasn’t until 2008 that vaccination teams, on bicycles like us, reached Bolaiti from Mbuji Mayi, the provincial capital, over 800 km away. Tom, with a big Hart smile (he’s my brother-in-law) walked over and carefully stretched out Alima’s withered legs. As a high school student Tom worked at a summer camp for crippled children. “She should have braces and crutches” he said, “but the longer she remains without these, the more difficult it will be to straighten her legs so she can get off the ground”. It was quickly decided, Alima should come to Kindu where she could be treated at the Handicap Center established by the Catholic Church in the early years after independence. She would be carried by bicycle, 120 km, three days over the same track we were going to cross ourselves. Between Bolaiti and Kindu are lots of swollen streams. Here Tom Hart crosses one with the rest of our bicycle peloton. Alima had to be carried across many like this. Early last Sunday, she arrived at our door in Kindu, wide-eyed on the back of her uncle’s bicycle. 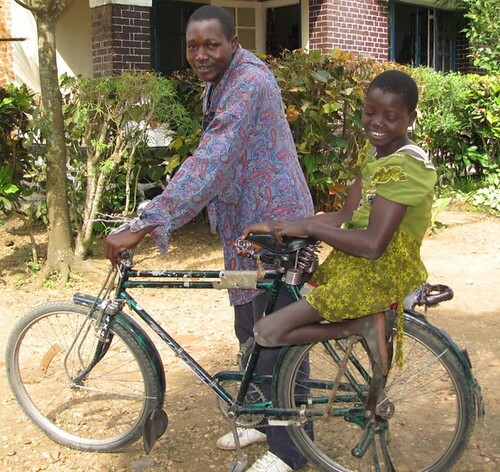 Alima made the three day trip from Bolaiti to Kindu on the back of her maternal uncle’s bicycle. Her knees, swollen from the polio and years of crawling over the ground need surgical intervention to allow her legs to be straightened and fitted with a steel brace so that she can use crutches. Over the past week, Alima has been carried to the Handicap Center for tests and evaluation. She will require surgical intervention. Once she heals she will be fitted with steel leg braces and given a pair of crutches. Total estimated costs for the surgery are about $300. An additional $100 will be required for physical therapy, leg braces and crutches. 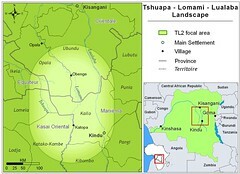 Alima’s family can raise 100 dollars by selling goats; our TL2 project will seek the remaining $300. Alima’s surgery is scheduled for the end of March. 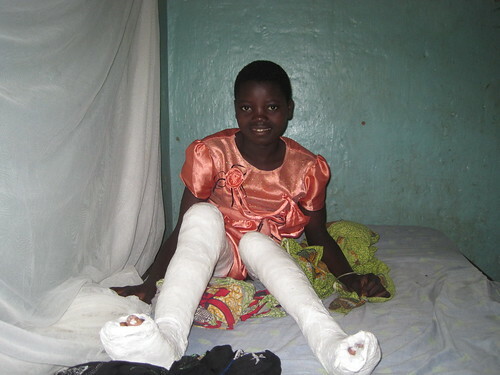 We will add a post-surgery update and a photo of Alima on her crutches. We invite our readers to contribute to help cover the costs of her surgery and recovery. Contributions can be sent to the project though our pay pal (Donate button in side bar). Drop me a note as well so we can tell Alima. Thanks. Alima’s surgery was on 26 March 2011. We thank our readers for making it possible. The surgeon was Dr. Kamba and head nurse Sister Henriette. Three days later Alima is recuperating and looking forward to physical therapy and new mobility. This entry was written by Terese Hart, posted on 2011-03-11 at 11:50 pm, filed under About the project. Bookmark the permalink. Follow any comments here with the RSS feed for this post. Post a comment or leave a trackback: Trackback URL. I have left a donation via your Paypal button for Alima. Please wish Alima all the best for her health and studies. Great to see brother-in-law Tom there as well! Lovely story of hope and happiness given. Very nice post John and Terry. Peace is flowing like a river. This is truly what peace is all about. Great news Terese. Give my best wishes to Alima for her recovery. This inspires me to go to work and earn more to help people in the Congo.